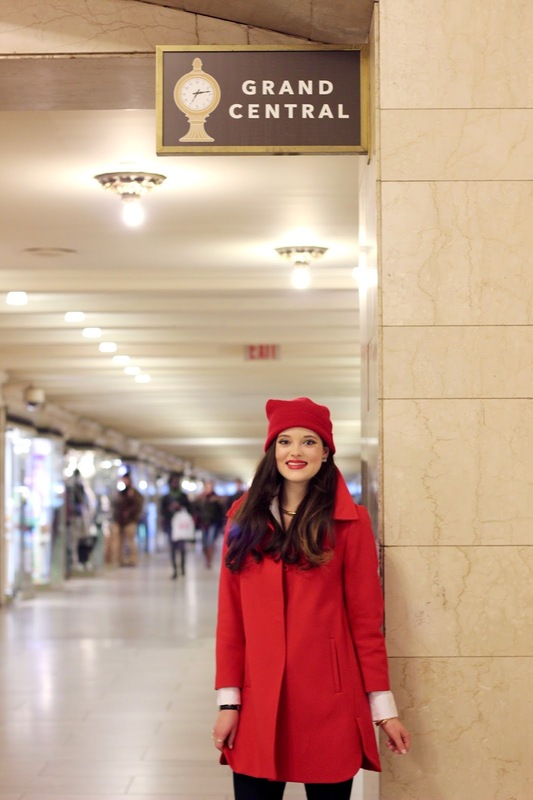 The first look in my series is centered around the most festive color of them all -red! 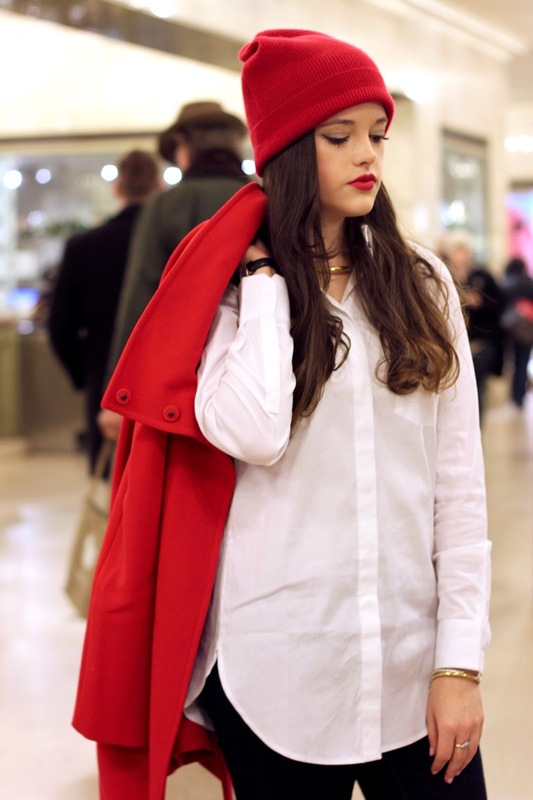 Incorporating a splash of red into an outfit is hands down the easiest way to show your holiday spirit. 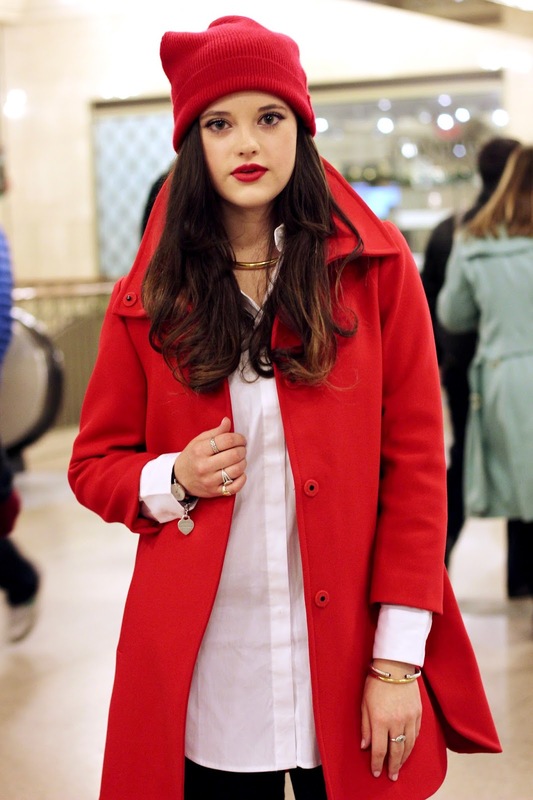 You can participate minimally with just a swipe of red lipstick or you can mix in a red accessory or two...or three! Super dark wash skinny jeans are a modern classic staple that are 100% party approved. I like mine perfectly tailored to hit right at my ankle so that I can easily showcase my footwear. A good rule of thumb for denim: the darker the jean, the dressier. 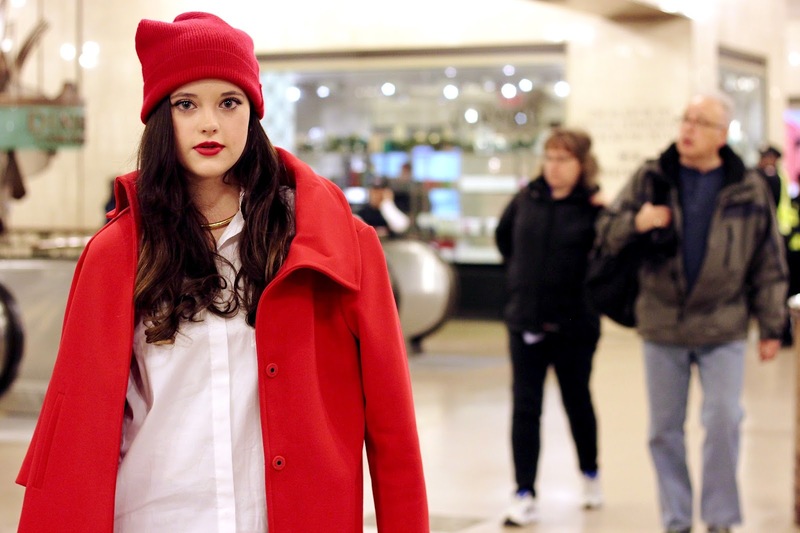 I love the look of a red coat. 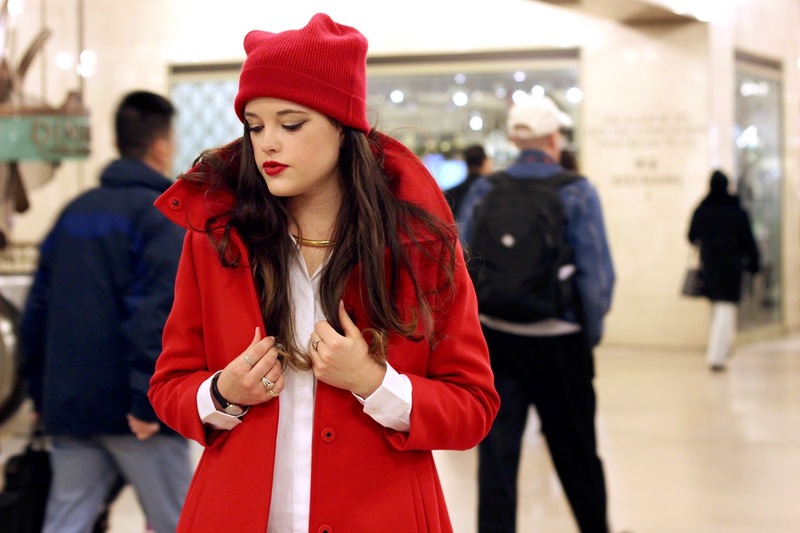 A red coat is bold, timeless, and effortlessly stylish. I throw on this statement piece and I'm instantly dressed up. I was so excited when I found this beanie to match my coat. Playing matchy matchy with solid colors is a quirky way to add personality and style to your holiday looks. And the best part? This beanie's cashmere so it keeps my head extra toasty! Underneath my coat and hat, I kept my outfit clean, crisp, and classic. A white button-down is completely polished and suits any occasion. A tucked-in blouse is a bit dressy so I chose a relaxed, oversized version that I could leave untucked to compliment my form-fitting denim. How's this for party-perfect pumps? 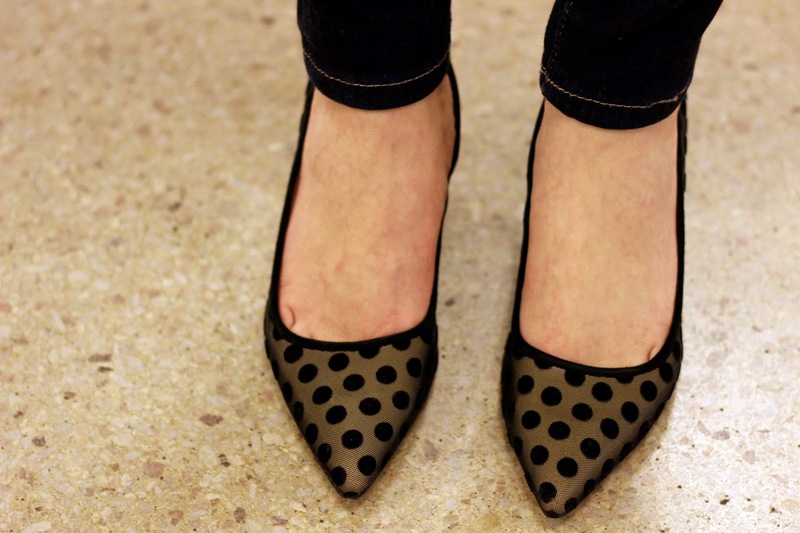 I love how these velvet polka dots are so fun and girly. They add subtle personality to any outfit, which makes them ideal for both the office and the after party. A minimal choker makes a bold statement when worn underneath a blouse. Just a peek of gold is all you need. 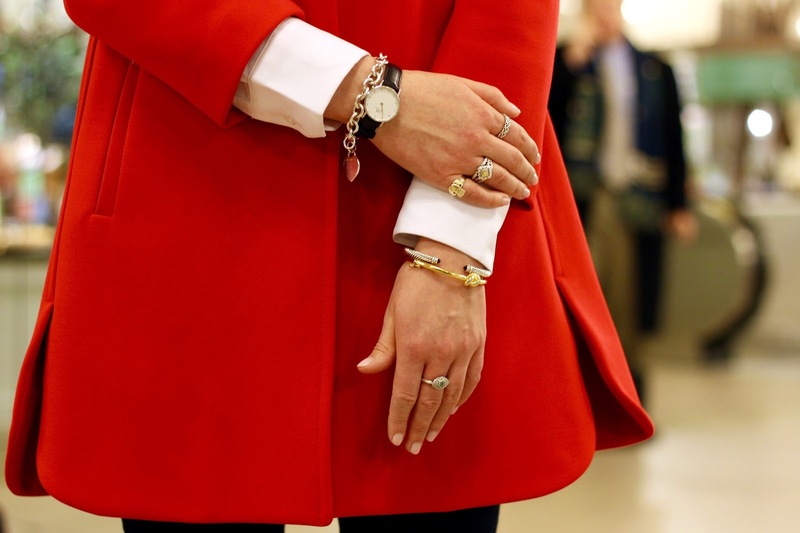 I paired my bangles with exposed white sleeves for a layered look. I'm kicking off my Holiday Denim trilogy in Grand Central Station for my first ever indoor photoshoot. So much traveling happens here this time of year and I just love the energy in these shots. This is the kind off look that'll help you stylishly stand out amongst the hustle & bustle of the season. That coat is lovely! You look fab! This is such a beautiful holiday outfit! I love love love that coat. It is stunning. 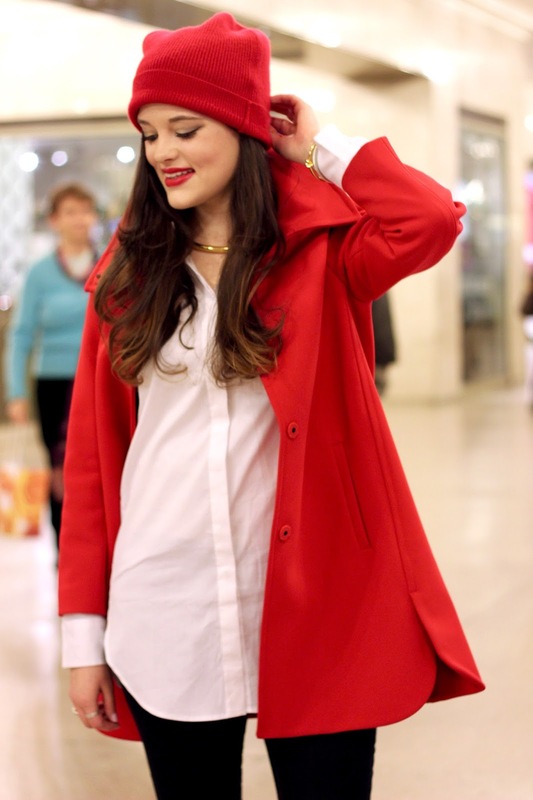 This red coat is just amazing! wow! love the look! amazing blog, follow on GFC? You look fab in red, I love yout coat and your dots heels! You look great in red!!! great look! love the coat and beanie! red its you so well! You look so amazing! Gorgeous! These photos definitely captured the magical holiday mood. I love the fact that this outfit looks so Christmassy without looking like a costume. Oh! And those dotted heels are beyond adorable! Wow! Looks so attractive darling! Beautiful pictures! Great outfit, I really enjoyed this very much. All the outfit looks good on you..
U look like female Santa! I love the red jacket! it is so amazing. You look beautiful in red - very festive! Red suits you perfectly! Getting into the Christmas spirit I see! Perfect holiday friendly outfit Kathleen, loving that coat and hat combo. Red is such a gorgeous color on you! I love this look! Ah, GC I will be commuting through there on a regular basis soon. Your a brave blogger to take on shooting in GC station. You look great, love the red and doesn't everyone look so joyous behind you? Haha. Wow! Grand Central Station! What an awesome place to do a photo shoot! So much excitement there! I love your idea about wearing denim at this time of year instead of dresses and skirts. Who knew denim could look so well put together! 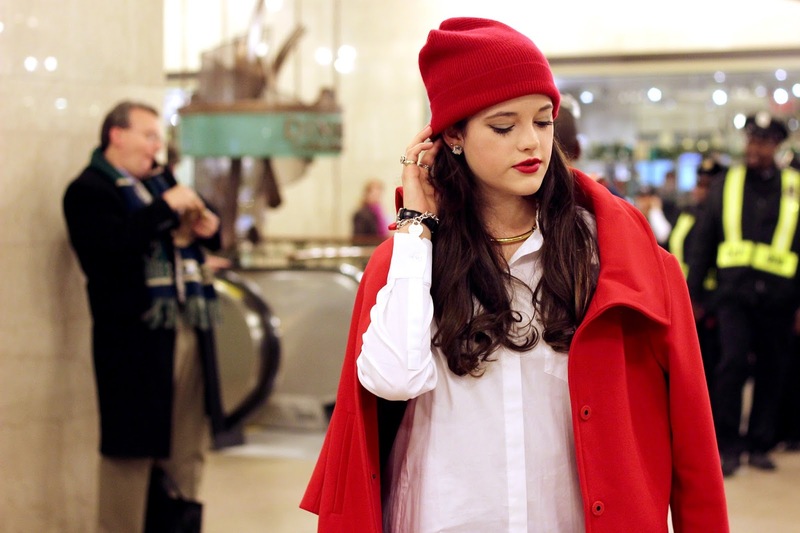 I just adore how perfect that red coat is with your beanie! You look so perfectly put together for your holiday look! I can't wait to see your other denim looks! The coat is absolutely gorgeous. 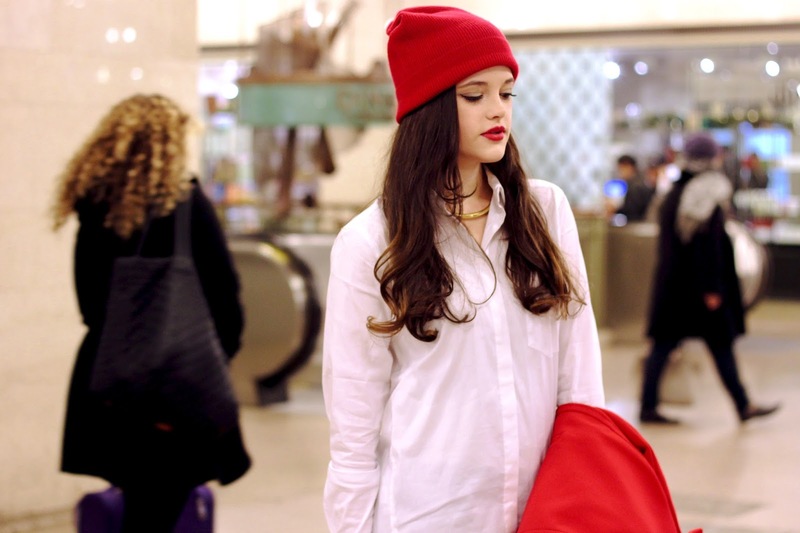 I love red on you, wear it more often! !